Manufactured homes are becoming a more enticing option for homeowners all over the country as they offer comfort, space, and affordable payments. While many may not realize it, financing a manufactured home is similar to a mortgage you would pay for a traditional house. The trick to getting the best deal on such a property is to have a thorough understanding of your options and what your current financial standing affords you. How Will You Pay for a Manufactured Home? Getting a mortgage for a non-traditional home is possible but requires different steps than you might be familiar with. Since not all manufactured housing is considered real estate, your purchase may not qualify for a traditional home loan. Any manufactured home that is at least 400 square feet and sits on an approved foundation can be taxed as real property, and, therefore, is eligible for a mortgage. These loans are an option for those who can put at least 5% down and are buying a home that is relatively new. 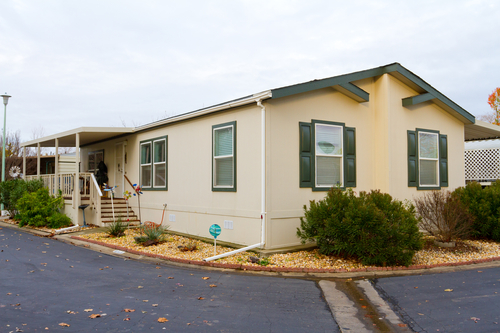 FHA loans and financing from USDA and VA are other avenues to finance a manufactured home. Personal loans also work, just as long as your lender has approved the purchase beforehand. Getting a loan for manufactured homes works similarly to a traditional loan, but the terms vary slightly. Interest rates are higher than mortgage rates because loans for movable property are riskier for lenders. Your loan lender will check that you have a FICO score between 500 and 580 to determine how large your down payment must be, usually between 3.5 and 5%. VA loan programs require a full 5% down payment on the space, although the loan terms are shorter—typically between 20 and 25 years, depending on the size and age of the property. Those who qualify for USDA (rural housing) loans may not have to put any money down initially, but the manufactured home must be brand-new, and the owners are required to show proof of eligibility to meet income guidelines. For those who opt for personal loans, a high credit score is crucial as the loan is unsecured and may require collateral. They should also expect to pay slightly higher interest rates as the lender will need to avoid defaulting on payments. No matter how you choose to finance them, manufactured homes are an excellent option for anyone looking for a comfortable and space-efficient dwelling. If you’re looking at homes for sale in Kerrville, TX, work with Spears Mobile Homes. Since 1976, they have been the area’s go-to name for top-of-the-line prefabricated houses. With a wide range of high-quality products, they offer a custom floor plan and exterior upgrades. For more help, visit them online or call (830) 895-3003.